Following up on last week’s excursion into embroidered stories and the Prestonpans Tapestry, here are a few embroidered stories that I hope you will enjoy exploring. Great events in history, and especially great conflicts, have been retold with needle and thread since the Middle Ages. The Bayeux Tapestry is the first example of this. The two great conflicts of the modern era – World War I and II – have been retold in stitches through a few well-known and lesser-well-known projects that should be well-known. The Embroidery is a tribute to our Country and Countrymen over the part played in defeating a great evil that sprang upon the Western World. It is not, and was never intended to be, a tribute to war, but to our people in whom it brought out in adversity so much that is good, determination, ingenuity, fortitude and sacrifice. As Time distances us from these massive conflicts that affected all of our ancestors (and hence, us) in one way or another, the stories below serve as a good reminder. Fabric of Survival: The Art of Esther Nisenthal Krinitz is a series of 36 fabric art panels that employ embroidery, painting and appliqué in a bold, folk style to tell the story of Esther and her sister Mania and their survival during the German occupation of Poland in World War II. On the Art & Remembrance website, you can read Esther’s story and view the individual panels in the gallery. It’s also worth taking the time to watch the 30-minute documentary, Through the Eye of the Needle on YouTube, where Esther and her sister are interviewed and where you can see close ups of parts of the panels as their story is told. 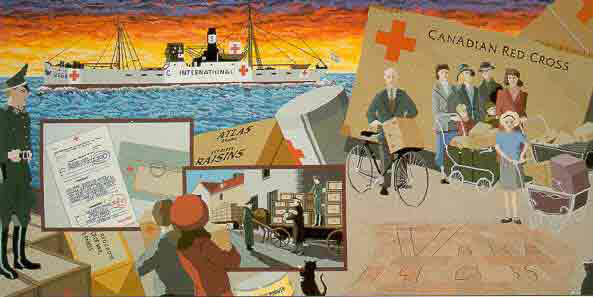 The islanders of Jersey, to celebrate the 50th anniversary of liberation of Jersey from German occupation at the end of World War II, collectively created a 12-panel tapestry that retells their story of life under German occupation. Through a community effort, the twelve panels were completed by Christmas, 1994. Over 7.5 million stitches and 275 shades of wool went into the tapestries, which were stitched by teams from each of the twelve parishes on Jersey. 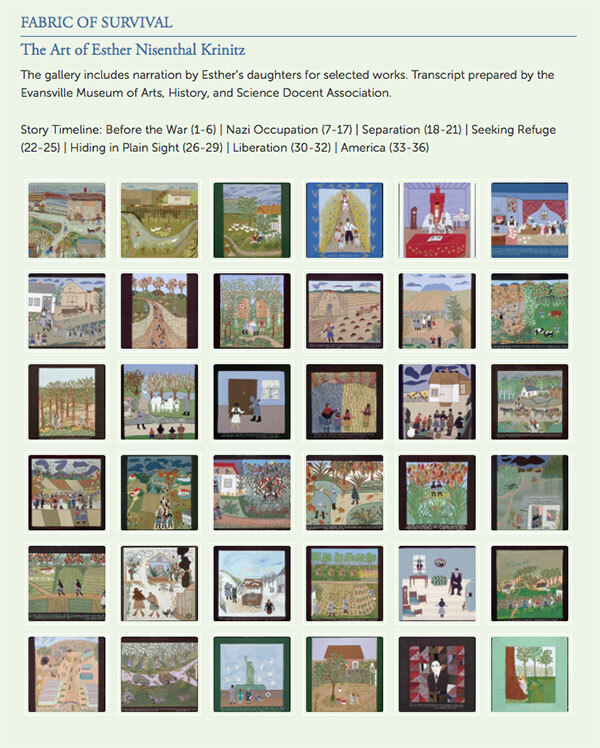 You can read all about the Occupation Tapestry and view the panels on The Occupation Tapestry Page on the The Island Wiki. The Occupation Tapestry is housed at the Occupation Tapestry Gallery on Jersey, where it can be viewed by visitors to the island. 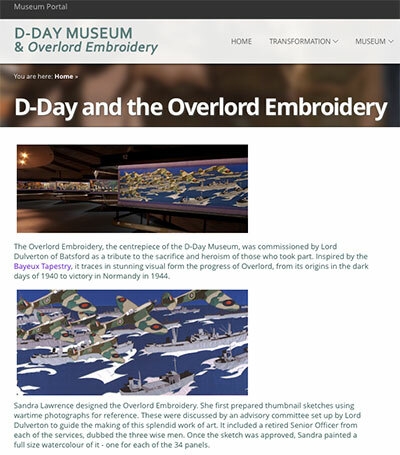 The Overlord Embroidery, housed at the D-Day Museum in Portsmouth, is a series of embroideries that relates the story of Operation Overlord, the decisive D-Day campaign, and final victory at Normandy in 1944. Slightly different from the tapestries perviously mentioned, but perhaps more in line with the Bayeux Tapestry which inspired the idea, the Overlord Embroidery was a fully funded commission stitched by the embroiderers at the Royal School of Needlework. The panels were designed by professional artist Sandra Lawrence. Begun in the 1970’s and consisting of 34 8-foot by 3-foot panels worked in embroidery and appliqué, the panels were stitched over four years by 25 skilled needleworkers at the RSN. The D-Day Museum in Portsmouth was built to house the embroideries and was opened in 1984. Visitors can see the embroidered panels on display there. The original paintings of the panels are on display at the Pentagon. The Gordon Highlanders Great War Tapestry, commemorating the sacrifices and heroism of the Gordon Highlanders in World War I, is underway in Scotland as we speak! Although they don’t have a website (yet – there’s always hope! ), you can follow the development of the Gordon Highlanders Great War Tapestry on Facebook, here, where they post photos of their work. This is another community tapestry, stitched by volunteers in Aberdeen and Huntly, and designed by Andrew Crummy. I hope you enjoy exploring all of these embroidered stories more thoroughly! More embroidered stories coming up later! Just had a quick look at all the tapestries above and they are fascinating. Especially the The Art of Esther Nisenthal Krinitz I just watched some of the video and I will definitely watch later in full detail it’s such an interesting story. I notice the Occupation of Jersey is being shown at the Maritime Museum here in London I will definitely have to go along and visit the Museum. I really like these historical accounts all told in embroidery form which is are fascinating. I’m off out now, so will look later. Thanks for the information on the Tapestries and for sharing the websites with us. This is more so related to yesterday’s post, but: How well does the carbon paper method of transferring an embroidery design work? Would you recommend that I try it? I’d be very grateful for any advice you could give me. Mary, a most interesting post today that shall take me many hours to totally read and comprehend. A few years back I did 14′ 7 1/2″ of excerpts from the Bayeux Tapestry in two panels 14″ high. Before I started that piece I had never given much thought to the individual people involved or how their personal lives were changed by that event. But, as I stitched, I thought about those people – a fitting tribute to both the Norman and the Anglo Saxon peoples. As I read your links today I am sure I will think so much more about the individuals as they lived through the difficult times portrayed. Sometimes history books and paintings can be so lacking in the human touch of “Needle “n Thread”. Mary, I’ve just looked at, read and listened to all your references of ‘The Fabric of Survival’ of which I was unaware. The fearful story, the courageous embroidery. What a marvelous job you did in relaying information to your readers about embroidered stories of World Wars. I do the newsletter for our local Friends of the Library and am going to use some of that info to relate to my readers that there are other means of telling a story besides Kindles and hardcover books. More awe-inspiring in my opinion. Thank you for all you do for the needlework community. Mary, thank you for sharing these. They are amazing. Esther Nisenthal Krinitz’s embroidered narrative was so moving! Thanks for sharing that, Mary. My dad was a history teacher, he would always say it was so important to know and understand what happened in the past. What a great interactive way to tell stories, making pictures with embroideries and tapestries and sharing what you went thru in your own words. That’s the way to make it real. I loved Esther’s embroidery. It was amazing. I watched the video and was truly touched by her use of embroidery to convey her story of the holocaust. In Rhodesia, where I was born and brought up, the Women’s Institute embroidered a series of ‘tapestries’ to illustrate the history of the country. It hung in the houses of parliament until Rhodesia became Zimbabwe in 1980, when it was put into the museum in Bulawayo. I have a book that was written about it by Oliver Ransford. Just a quick note to thank you for this post. The panel on aviation is striking realism of such valiant knights leaving for the Crusades, but I was especially touched by the signs “of life” The island Wiki. Big, big moment of emotion. This it truly fascinating. I must say that I am really glad to see that embroidery is still a tool to document and cope with extreme times. What I would find also interesting is to compare the embroidery done by the “other party” in WWII. I wonder if the different position and conception of what was going on is reflected in the embroidery of, say, a German stitcher at that time. Thank you, Mary, for this wonderful post. Does anyone know if The Fabric of Survival is on display anywhere? Thank you, Mary. Two of those are within reasonable driving distance for me. And another thanks for your post. This was so touching (the one from WW II) Thanks so much Mary. Mary, I was too young for WWI and WWII but I went ahead and looked at the Palestinian Tapestry. I commented that the artists with their ability can now share this with the whole world. I feel the same way about the tapestry artists of WWI & WWII. They see the world in a way no reporter could convey it through through their work. I will forever be grateful. As I had been born after both World Wars. But, you Mary have opened my eyes to new and amazing things in the world around me. And for this I shall be blessed forever. This post was sitting in my inbox for a while, until I could set aside a decent amount of time to read it. I am so pleased I did! I particularly enjoyed Fabric of Survival, an awful story, but so beautifully represented. I have visited many museums and memorials in Europe focused on the war, and it was lovely to see a personal textile representation. I continue to be an avid follower of your blog, I always feel challenged, and almost always learn something new!